Take your sewing projects with you! 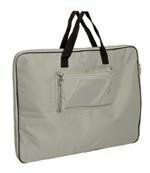 Grey 20" X 26" Large Travel & Storage Bag fits 18" x 24" Sew Steady Table. Outer shell made of durable Nylon. Padded with foam insulation to protect table for travel or storage. Two secure carry handles for easy transport. Front zipper pocket, double zippers for easy loading.